In this article, I'm going to discuss four common mistakes marketers make that drag their AdWords clickthrough rate (CTR) down, and I'll show you how you can write ads that get 2-3 times the average CTR. We've analyzed millions of dollars in ad spend by advertisers of all sizes across all industries, and we've found that they are making these four mistakes. That's good news for you: Once you learn to identify and remedy these missteps, you will have a definite edge on your competitors. Each blue dot in the figure represents an advertiser account. 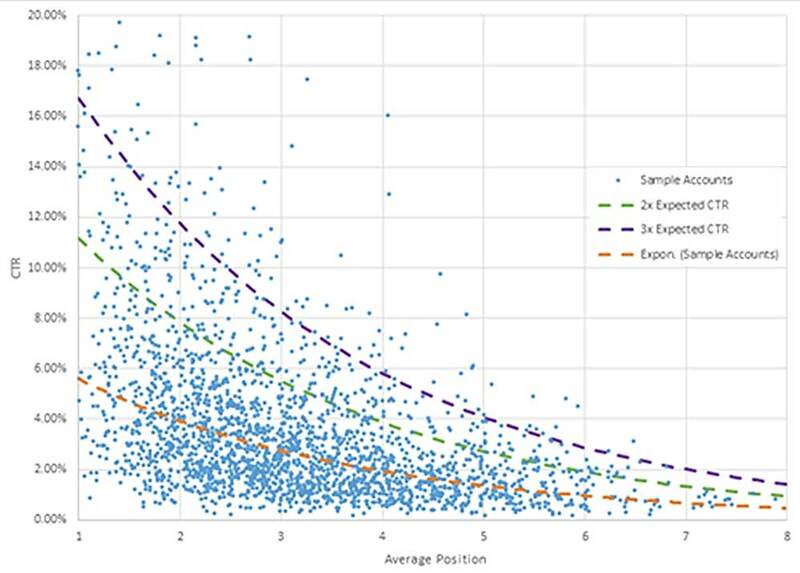 The orange curve is the average advertiser account CTR (note that this is not for individual ads but for entire AdWords accounts) by ad position. The green curve shows accounts performing at twice the average CTR, and the purple curve shows those that have three times the average CTR. As for those blue dots way up at the top... those are the top performers: accounts with average CTRs that are far outperforming their competitors and exceeding the average by up to six times. First, let's discuss why you should strive for much better CTRs.